Before he ran for president of the United States, Donald Trump made a good deal of his money as a real estate developer, and many hotels, residential buildings and office towers bear his name. But one group of tenants have fought to change that, and on Tuesday, they won. 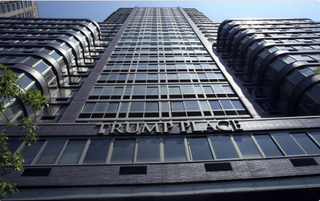 In October, residents of a trio of apartment complexes named Trump Place on New York City’s Upper West Side filed a petition to have the name removed from their buildings, saying that they were embarrassed to be associated with Trump, the Washington Post reports. On Tuesday the company that owns the buildings acquiesced and told the residents that the buildings would be renamed after their addresses—140, 160 and 180 Riverside Blvd.—and that Trump’s name would be removed from the buildings. According to the Post, more than 600 people had signed the online petition to “Dump the Trump name” and take down the “Trump Place” lettering, saying that they were appalled by Trump’s “treatment of women, his history of racism, his attacks on immigrants, his mockery of the disabled” and other issues. Although the buildings had continued to bear his name, Trump has not owned the property for more than a decade, according to the Post, and a spokesperson for the Trump Organization said the decision to change the name was mutual.